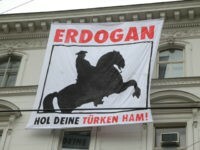 The hipster-right Identitarian youth movement in Austria hung a large banner on the Turkish embassy in Vienna telling Turkish President Recep Tayyip Erdoğan to take his supporters back home to Turkey. Turkish President Recep Tayyip Erdoğan has warned the European Union (EU) that if the diplomatic spat between Turkey and several European countries continues, Europeans won’t be able to walk their own streets safely. Turkey’s Foreign Minister has said Europe is being ‘dragged into the abyss’, warning that religious conflict will soon erupt on the continent’s soil. Turkey’s Recep Tayyip Erdogan on Thursday accused the EU of starting a “crusade” against Islam and said his country was no longer friends with The Netherlands, further souring relations. 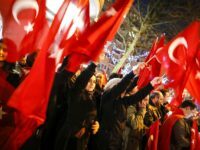 Turkey halted high level relations with the Netherlands on Monday, citing the Dutch government’s barring of Turkish politicians from holding rallies ahead of a referendum on a new constitution.